Papua New Guinea rewards adventurous divers with some of the richest waters on our planet. PNG’s largest offshore island is New Britain and the waters that surround this island are a diver’s paradise, whether you love diversity, pristine corals or dives with schooling pelagics you will be in awe of what these waters hold. Many of the reefs have resident schools of Barracuda, Tuna and Jacks and a range of shark species are regularly sighted, including Silvertips. Our 10 night trip will take you to the most revered dive sites in New Britain, starting in Kimbe Bay and then moving out to the offshore Witu Islands and Father’s Reef before returning to Kimbe Bay. The coral reefs in Kimbe Bay are extraordinarily rich – a recent coral count revealed an incredible 413 species of hard coral. This is over half the total world species in one Bay, a truly remarkable statistic which makes Kimbe Bay the “Coral Capital of the World”. Over 900 species of fish have been recorded and this number will continue to grow as more research is done. At the Witu Islands, there are fantastic macro dives and schools of pelagic fish abound on the world renowned Lama Shoals, a sea mount rising to within 15 feet of the surface from the surrounding deep waters. Father’s Reef, to the north east of Kimbe Bay along the northern coast line of New Britain, is a series of offshore reefs, which are the sunken remains of a huge extinct volcanic caldera. The reefs have interesting topography with swim throughs and arches adorned with soft corals and other sea life. Being offshore, these reefs attract many pelagic species including Sharks, Tuna, Barracuda, Turtles and Rays, which all come in to feed off the prolific reef fish and other invertebrate species that have settled here. 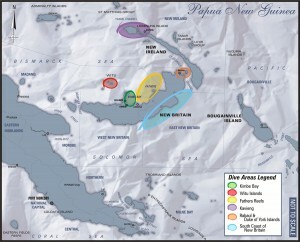 Dives at these offshore reefs can include encounters with Silvertip, Whitetip and Grey Reef Sharks. MV FeBrina came to Papua New Guinea as the life time dream of Captain Alan Raabe, combined with the foresight of Max Benjamin at Walindi Resort. With Walindi Resort as her home port, and under the management of Alan, MV FeBrina has evolved into a world-class liveaboard, providing a unique diving experience in the bountiful waters of New Britain. MV FeBrina is 73 feet of liveaboard comfort and convenience. She is a stable and extremely seaworthy motor vessel, well set out and catering for serious divers and photographers who want a total PNG dive experience. MV FeBrina has accommodation for 12 passengers in 7 air-conditioned cabins, all with ensuite facilities. Air-conditioning units are all individual split system units, controlled from your cabin. The cabins have been custom built to include plenty of storage area and make maximum use of space available. Bathroom facilities all have regular flush toilets. The dive deck is well set out and diving couldn’t be easier, donning your gear at the dive consoles and entering the water via the water level duckboard. FeBrina’s crew are locally trained as divers, and they specialise in combining excellent service and meals in combination with the ultimate diving experience. The crew are friendly and humble, always ready to offer a smile and a helping hand. They are extraordinarily good “spotters” often pointing out elusive and rarely seen critters, much to everyone’s delight. There are spaces available on this trip. The cost of the trip is 4,990 USD in a Double/Twin cabin or 5,440 USD in a Single cabin. These prices include 10 nights on FeBrina with up to 5 dives per day (inc night dive), tanks/weights/weight belts, all meals, wine with dinner, airport transfers, and dinner at Walindi Resort on the final night. Flights are not included in the price, but can be readily arranged by Equator Diving upon request.